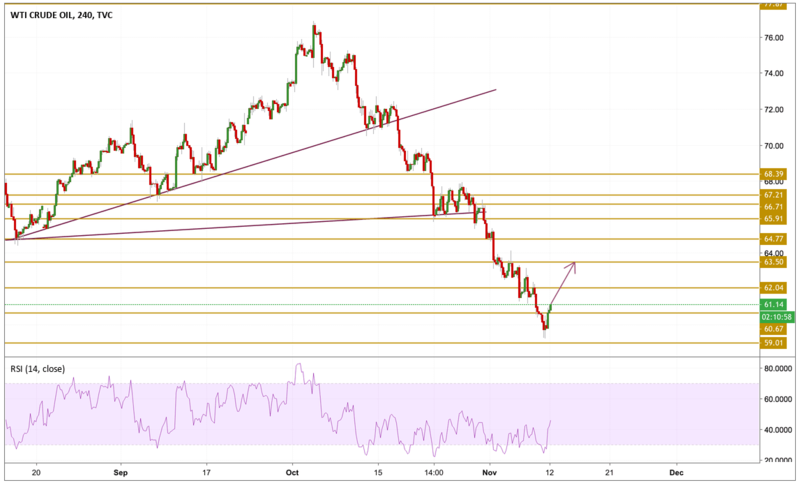 Saudi Arabia is set to go ahead with plans to begin clamping down on oil production, wiping up to half a million barrels per day off of their outflows in an effort to put a floor underneath Crude's recent declines. Khalid Al-Falih told reporters that Saudi Aramco’s customers Crude oil nominations would fall by 500K bpd in December versus November due to seasonal lower demand. He also said that the cut represents a reduction in oil supply of about 0.5%. As expected, Crude oil prices headed to the $59 support level before they entered into recovery mode fleeing oversold conditions. The price is currently hovering above the $61 level with a solid momentum as we can see on the RSI. The upward move seems pretty certain, that is why we will be focusing on the $63.5 resistance level.